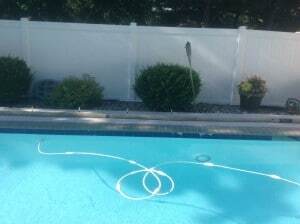 We Are Experts in Pool Deck Repair! Having a pool in Kansas City in the summertime is a great way to relax, enjoy the outdoors and entertain friends and family. Be sure to winterize your pool in the fall. In the summer, adding the right blend of chemicals to balance the acidity and chlorine and keeping debris, like leaves and cottonwood, out of the pool and skimmer is a weekly, if not daily task for some pool owners. When you open your pool every season, there is a process a pool owner follows in order to prepare the pool for the next swimming season. Take a walk around the pool deck. What do your notice? Have the slabs of your concrete pool deck sunken around your in-ground pool? Does the sunken sections of your concrete pool deck pose a tripping hazard? Stubbing a toe at the pool can ruin an otherwise great day by the pool. Your concrete pool deck was laid in sections. In some cases, the concrete may not have been sealed appropriately or the seal in and around the sections has worn away leaving your concrete pool deck vulnerable to cracks and crevices that water from your pool can further erode. 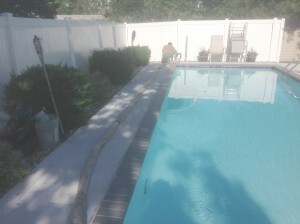 This erosion leads sections of your pool deck to sink and require repair. Using the traditional mud jacking method, which uses water, dirt and cement to lift a sunken slab, may not be the best choice of application for this project. Water from your pool is constantly being splashed in between and around the slabs, seeping water into the ground and increasing the possibility that more erosion will take place. Concrete Raising Systems uses Polyurethane foam to fill the gaps and spaces under your concrete pool deck. Our Polyurethane product is completely waterproof and made from recycled materials. Using our waterproof filler to raise your concrete pool deck not only saves you money but also ensures that the concrete that is raised is not further compromised and sink again. If you find that a concrete slab has begun to sink, that is the best time to call us for an estimate. The longer you wait, the larger the void becomes. Larger voids take more foam to fill and more foam will add to your cost. If you have a wall of any kind around your pool, it will be more difficult for traditional mud jacking companies to get to your pool deck. Our equipment fits in smaller spaces, has less mess and uses smaller hole sizes. Call (816) 419-8306 for your pool deck repair so you can enjoy your time in the sun this summer!